What child doesn’t love a good birthday party? Who doesn’t love a good birthday party at the campsite? When given the choice between renting out a party facility (pool, gymnastics, or activity centre), my kids prefer to celebrate their birthday parties at the campsite – hands down each time! Each year we try to do something a bit different. I would like to share with you how we celebrated Chloe’s 4th Birthday Party at the campsite. It was a Drive-In theme! The invitation to the party. 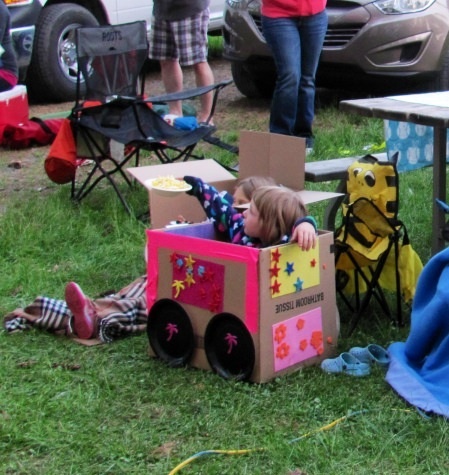 The kids decorated their own cars from boxes, which they could sit in while watching the movie. Watching Home Alone. 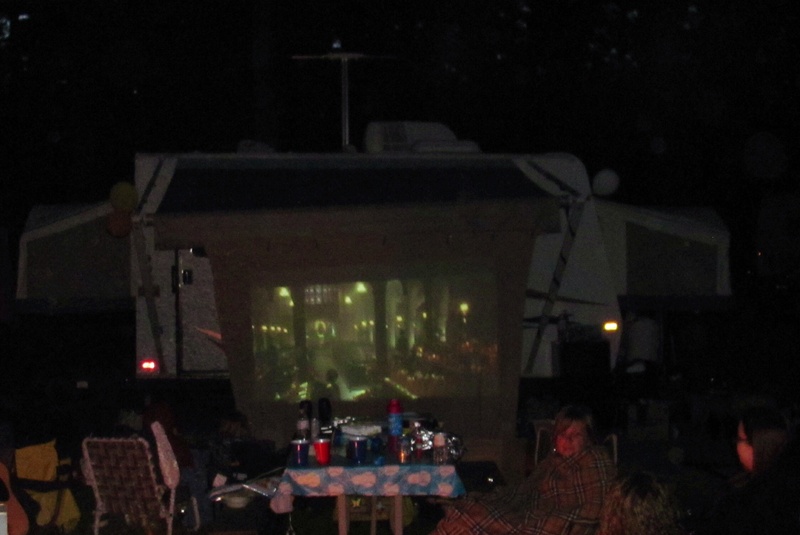 We hung a sheet to our awning, using clothes pins, and projected the movie onto it with an LCD projector. 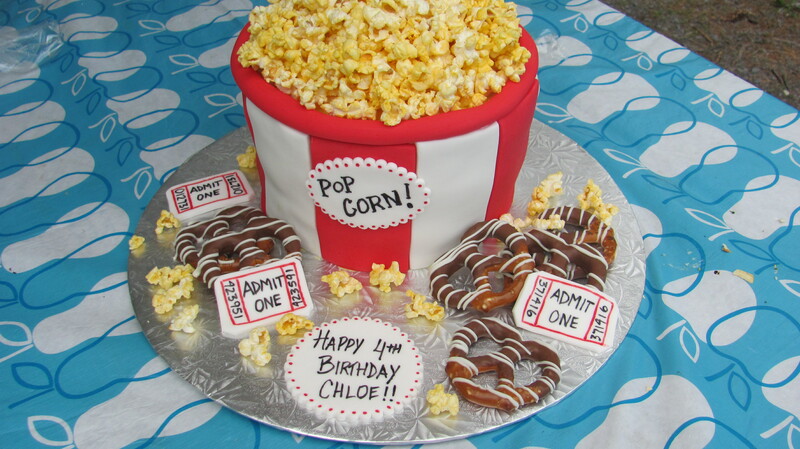 Drive-in theme cake, which had real popcorn on top of it. 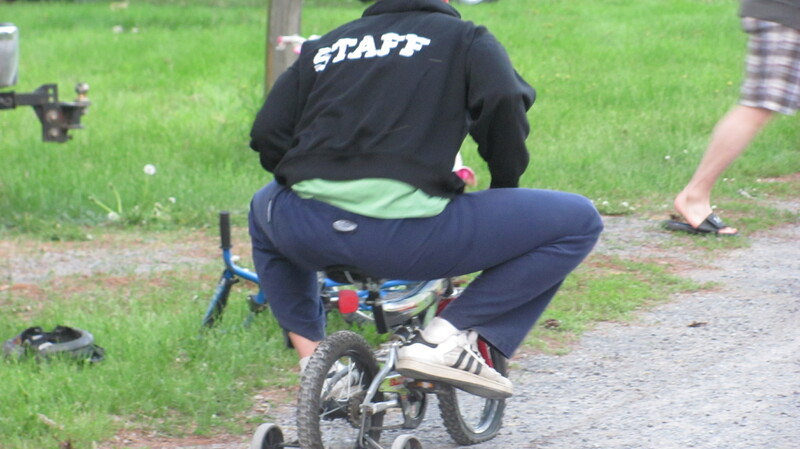 Even the adults had fun with their tricycle races. We gave each guest a popcorn container with a bag of popcorn, some magic milk straws, a few candies and a bolo-bat. I wish that we would have take picture of that as well. The party was a big success. We had strangers come over and watch the movie with us. It was a great way to celebrate my daughter’s 4th birthday. 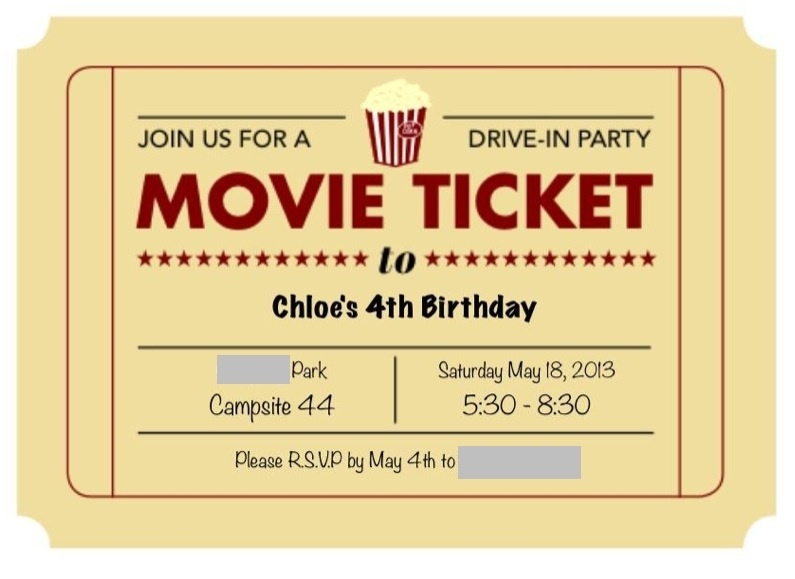 Just last week I asked Chloe what she would like to do for her birthday this year and she said that she would like to have her friends down to the campsite again. Now I just need to think of a good theme! If you have any theme suggestions, I’d love to hear them! 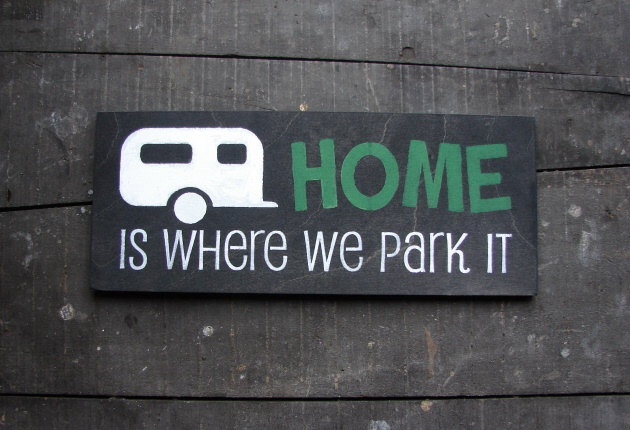 This entry was posted in Our Camping Stories and tagged Birthday, birthday parties, Birthday Party, Cake, Camping, Campsite, Decorating, Drive-In, Family, Food, Travel Trailer. Bookmark the permalink. What lucky kids you have. Did you make that cake yourself? I wish I could make this beautiful cake. A girl in my area makes them and she is very talented. I actually have to reserve my cakes months in advance!